Contemporary Folk Art, Created in Cornwall, available on eBay! Dead as a Dodo and other Halloween type things? 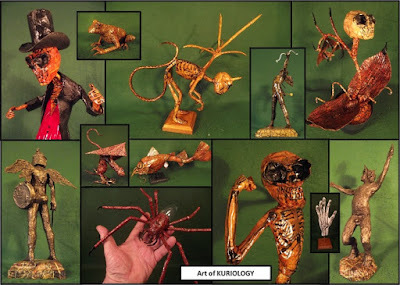 With such an unusually long hot & summer this year in the UK it seems to have impacted sales of Kuriology Art Laboratory items. 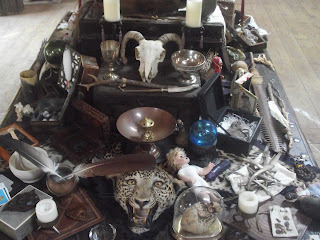 Now perhaps all the goths, steampunk-ers, oddity & curiosity collectors were twiddling their toes on a beach somewhere? However, since last September Kuriology sales had been steadily ticking along quite merrily up until the summer heat wave hit. Then, just like a trout stream, things dried up a bit. 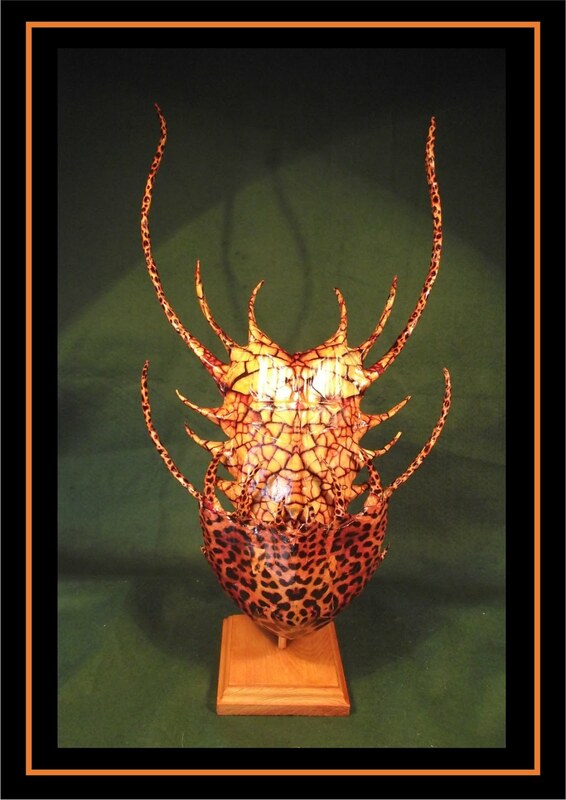 But Halloween is approaching, so (in theory) Kuriology Art Laboratory object sales should start to pick up. 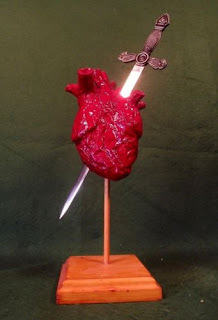 They are after all quite unique, one of a kind (OOAK) creations that fit well into the folklore, folk art, horror, goth, steampunk, museum, oddity collector niche. 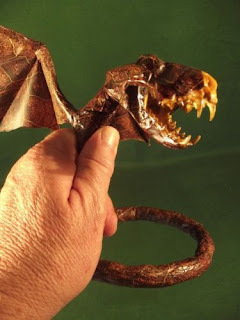 Unlike things cast from molds & made of plastic, Kuriology items are handcrafted, primarily made from recycled materials, they will age, & develop their own unique patina. 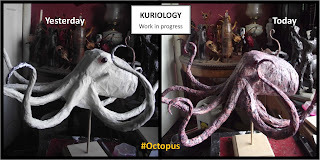 So what sorta of thing is likely to be found released from the Kuriology Art Laboratory? 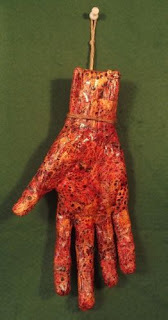 Well, things like that pictured above really, oh & the thing below...we think its a sort of 'Hand of Glory', but who knows what someone may use it for? Perhaps add a little sign- 'Shoplifters will be severely dealt with'? A Guide to Kuriology for ebay, but ebay scrapped their guide program? ...but ebay scrapped their own guide program? It had been on my 'to do' list for quite some time. To write a guide for ebay on Kuriology Art sculptures. I finally put aside some time after I noted a prompt from ebay. Spent a couple of hours scribbling away with big crayons & went to upload the Kuriology guide onto ebay. ????? But, No can do? A little further investigation (google) & discovered ebay have scrapped their own guide scheme initiative. In the process ebay dumping 500,000 guides written by enthusiastic ebayers? These guides as well as being informative, drove free traffic to ebay via google. 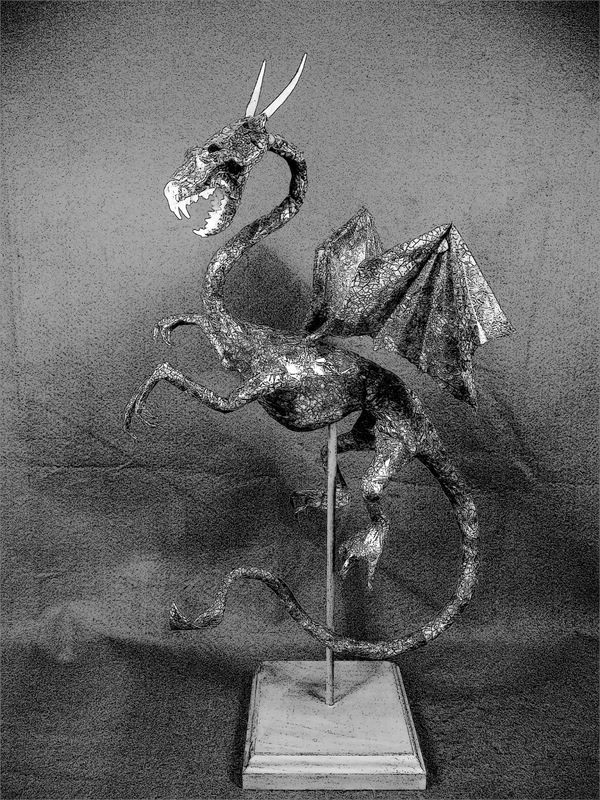 But since Kuriology sculptures use recycled materials, here is the ebay Kuriology guide recycled onto the blog. Made from found, recycled, re-purposed, re-used items & materials crafted into objects of primarily environmentally responsible or social commentary Art. 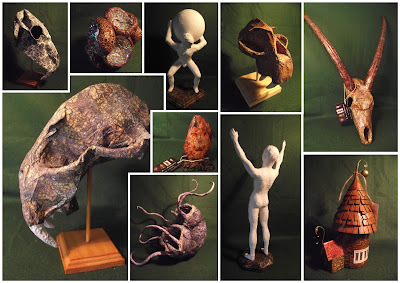 These creations have to fit into the artists spectrum interpretation of Wunderkammer ‘Cabinet of Curiosity’ objects & artefacts. The artist work often reflecting a personal eclectic interest in Antiques, Natural History, Taxidermy, Folklore, Occult & Witchcraft, Paleontology, Steampunk, Science Fiction, Classical Greek/Roman mythology & Art. All such subjects fitting into the artists broad umbrella perception of ‘Cabinet of curiosities’ and reflected in diversity of Kuriology collectible décor creations. 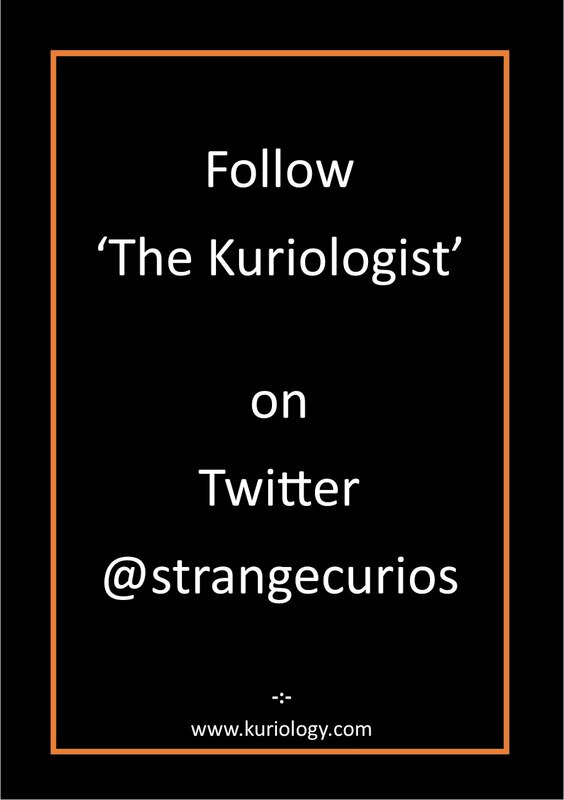 Who is the Kuriologist? A cognitively disabled self-taught ‘Outsider’ artist. Following a prolonged period of years of authority (& others) instigated physical assaults & physiological intimidation & hate crimes against him, the artist suffered severe catastrophic trauma. During later clinical & forensic medical diagnosis the artist’s condition was likened to that of ‘a person repeatedly exposed to life threatening situations’ (ie: living in a war zone). Cognitively impaired with PTSD (Post traumatic Stress Disorder) severe anxiety, physically painful panic attacks & form of (authoritarian) people related agoraphobia. The artist became housebound for more than a decade. During this time, he taught himself to sculpt from whatever materials available to hand & created 100’s & 100’s of sculptures which very few people ever got to see. How are Kuriology pieces made? 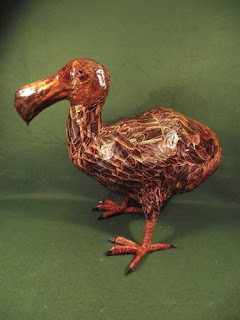 Using a range of diverse materials to construct form & body, & often incorporating elements of both traditional & contemporary Papier-mâché & decoupage techniques – the artist’s ‘vegetarian taxidermy ‘-pieces using no animal parts (Other than shellac polish). 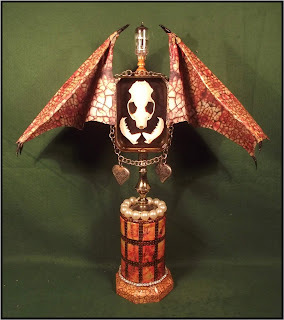 Kuriology assemblage sculptural pieces made up of multiple pieces & objects on social, political & other topics, broadly referred to by the artist as – ‘reliquary cabinets of collective curiosity’. 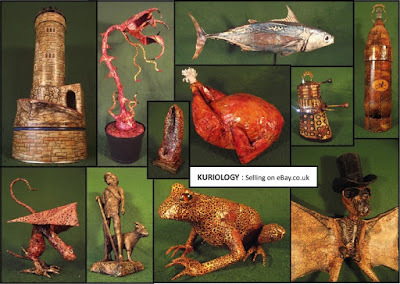 A back ground as a former antique furniture restorer, Kuriology art pieces often stained, French polished & by incorporating antique or old objects, have an overall antique or vintage feel & look about a completed piece. Where Kuriology has been exhibited? The Kuriologist lives in relative reclusion in an isolated rural area, seldom travels & feels disconnected, even excluded from conventional art & disability organisations. 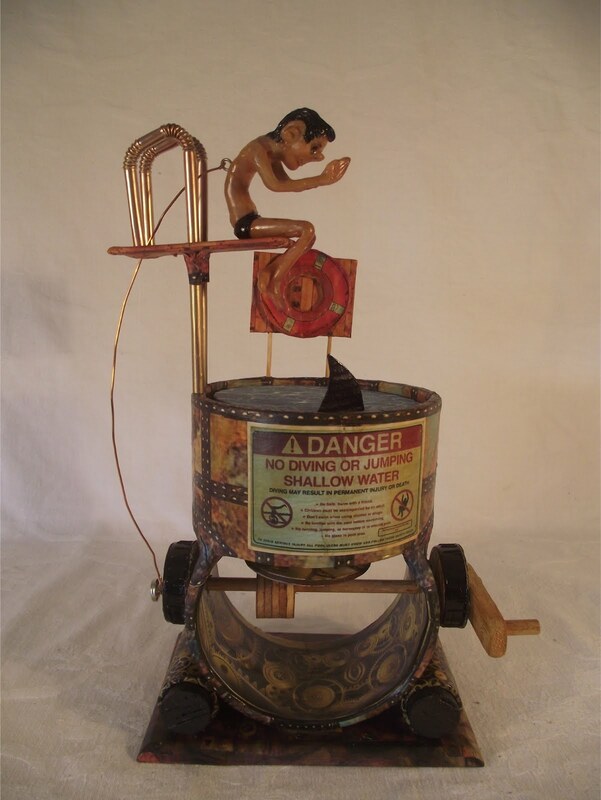 His work deemed by some as - to craft like for Art galleries & too Art-y for craft fairs. 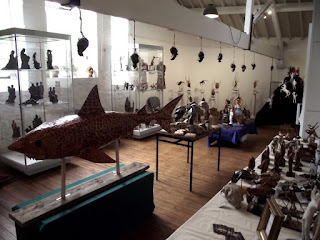 Although several galleries in Cornwall, UK, have taken & sold Kuriology Art, it is museums & antique shop environments in which Kuriology Art seems most in place. 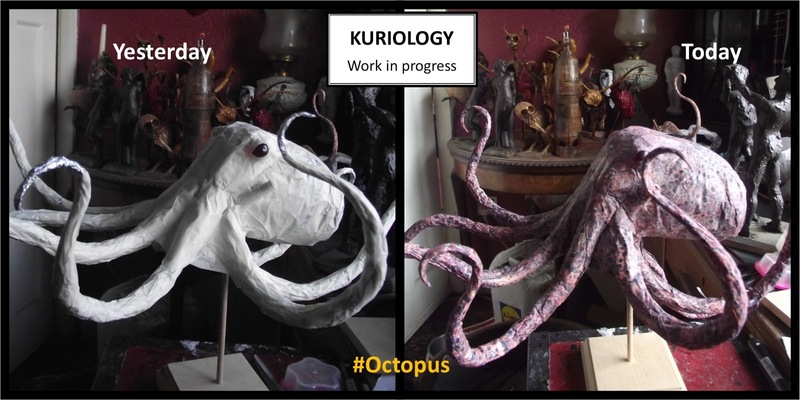 In June 2017 Kuriology held a summer exhibition at Helston Museum. Over x250 (tip of iceberg) Kuriology sculptures exhibited. Attracting double usual number of Museum visitors. 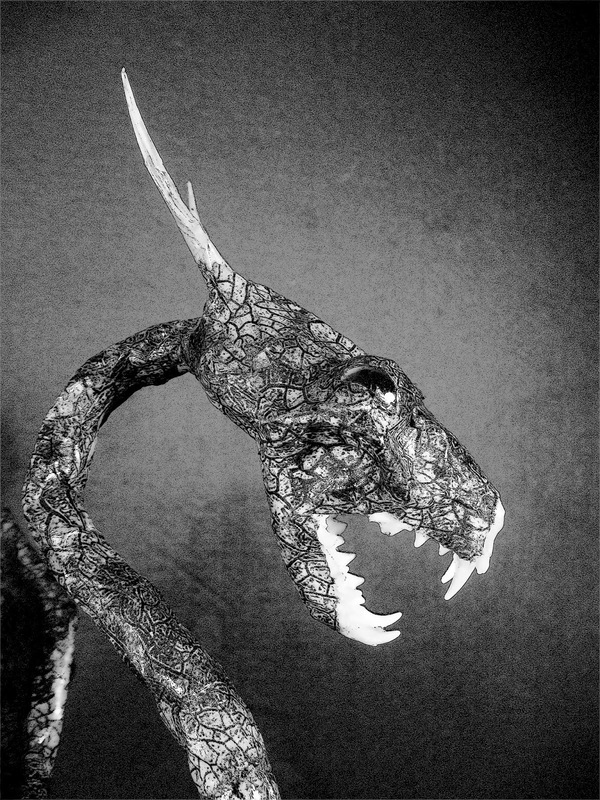 Also, digital exhibition of Kuriology art as part of ‘Alternative’ touring exhibition at Bristol Museum, Poole Museum, Falmouth Art Gallery & Cheltenham Gallery. 1. Environmental Credibility: Primarily uses recycled & re-purposed materials & resources. 2. Individually Unique: OOAK (One of a kind) Every Kuriology sculpture is individual. Some may be similar, but none are the same. No production line plastic resin moulds used here! 3. 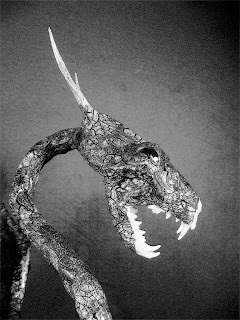 Collectible Curiosities: Sales indicate already a small ‘hard-core’ number of early-bird Kuriology collectors. When should you buy Kuriology sculptures? Well right now seems as good a time as any? Because when they are sold they are gone! Unique Cornish bat species of dragon-like underground adaptation or mutation in Nancekuke toxic environmental dumping in former mining area? ‘Nancekuke Slithering’ - So named due to its movement when escaping when chanced upon & after its initial 1st sighting location. A cryptozoology Troglophile semi-aquatic & flying/gliding species. A small, but voracious predatory mammal (cannibalistic in nature). Said to be exclusive in habitat found only in/around underground abandoned mine workings & cave environments of the former Cornish Tin mining industry -primarily Camborne/Redruth & surrounding geographical mining locality of Cornwall, UK. Mammalian: Length up to 1 metre. Completely hairless, with thick leathery skin. Head is mustelid like, with efficient canine teeth & flesh slicing incisors & premolars. Outstanding & unique biological feature are an unprecedented third pair limbs of small leathery wings. Speculated to be an opportunist ‘glide & strike’ aerial cave/cavern hunter. Theoretically derived from a sub-order of Chiroptera (Bats), although completely unlike any other hitherto known species of bat. To date; no live specimen recorded as having been retained in captivity. Appears to be utterly intolerant to both daylight & artificial light which seem to cause 'extreme' discomfort to its eyes. Has poor conventional eye sight, but may be able to detect prey by thermal, electrical and/or chemical marker indicator means. Extremely aggressive when encountered/cornered. Spits, or sprays regurgitated highly caustic gastric stomach acid which can cause severe burns, & pain to exposed skin & almost instant blindness if caught in the eyes of a victim. A small, rodent/rat like body torso (although not of a rodent species). It has an elastic like gut which can expand massively. This expanding stomach enables the creature to consume (comparative to its own body size) vast amounts of prey food in one feeding. A long slender snake like neck, with an expanding gullet & stomach, quite unlike any other species of mammal & more akin to that found in species of deep sea fish. Three toed claw feet on back & front legs, occasionally webbed. A long seemingly prehensile tail which can grasp & hold objects. The creature can also use its tail as a whip like weapon. Also, the tail used to restrict, crush, & suffocate prey much like a constrictor snake. Tail may occasionally have a small paddle-like tip to the end, thought to be an aid for swimming/aquatic hunting. Male & female Slithering's are believed to be approx. of equal size. Mature males reputedly have up to five (more commonly three) horny appendage spikes down its back along the spine. Horn like head appendages thought to sometimes occur in both male & female mature specimens. It is believed they give birth to live young, which are completely independent hunters from birth. The 1st born may even predate upon any other subsequent new born siblings for their first meal. In time of food shortage a fertile mother may also predate upon her own new born young. A voracious hunter predator, preferring live food but adaptable & will scavenge on any available meat carrion. Giving rise to theory these creatures ‘may’ be the original ‘Cornish knockers’, fabled underground creatures in Cornish mining folklore. From as early as the C17th, Cornish miners would sometimes hear ‘knockers’ underground. This was believed to be a forewarning of a mine collapse/flood & Cornish miners would leave food scraps for the creatures for luck, to appease & thank the knockers. Also, the ‘Slithering’ maybe responsible for sudden inexplicable occasional utter decimation of entire underground rat populations in mine workings. Prey:- 'They are what they eat' - has been said of them due to their diverse species environmental physical adaptations, being able to hunt by air, in water & by land - but only in the dark, sun-less environment. Believed to primarily prey upon insects, fish, crustaceans, small rodents (shrews, mice, voles, rats, rabbits), birds, bats – Will predate upon virtually anything it can tackle & can take prey up to & in extreme cases, in excess of x10 times its own weight/size. Also, cannibalistic, feeding upon its own species believed common place. 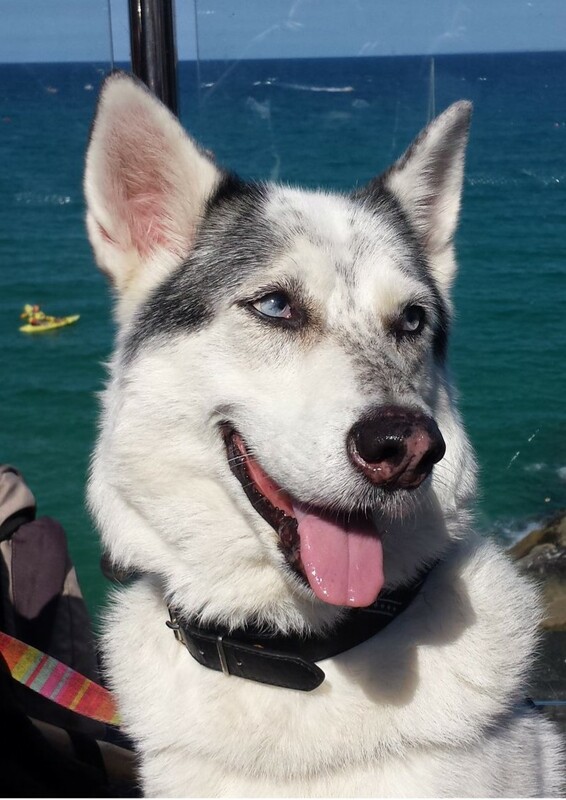 A spate of domestic cat disappearances & unexplained dog injuries & blind-ings since 2000 are attributed by ‘some’ & coincide with - increased sightings of ‘Slithering’ creatures in the same catchment urban human population settlement areas in Cornwall. This may indicate a possible expanding of subterranean ‘Slithering’ habitat territory from original ground zero sighting location & an increased diversity & expanding range of their selected prey food species. ‘Slithering’ as a separate species, first may have allegedly been reported sighted 1989 by local night sea anglers at Portreath, Cornwall. An accidental chanced upon night sighting by torch light on cliffs. This occurred near & very shortly after closure & subsequent demolition of the Ministry of Defence Chemical (& Biological?) warfare research facilities at Nancekuke. Nancekuke was a chemical (biological?) research facility, Portreath, Cornwall from the early 1950s. Chemical weapons, including Sarin & VX gas are known to have been manufactured there. The demolition & toxic material from the former research premises is recorded (Hansard: House of Commons Debate 18 Jan 2000 vol 342 cc818-26) to have been unceremoniously disposed of, reputedly buried (dumped) down abandoned nearby old mine-shafts. The area riddled with centuries of interconnected mine workings, many completely uncharted. A factor not disclosed, despite widespread local public knowledge, when the MOD Nancekuke chemical warfare research facility was proposed, then sited post WWII in the cold war political environment of the 1950's. Increased environmental concerns necessitated clearing of previously dumped Nancekuke toxic waste & began in 2003. Although questions do remain. NB: It is interesting to note former Cornwall Kerrier local council undertook a massive & hugely expensive program of capping hundreds of open mine shafts in their authority, which included the Portreath, Nancekuke area. This was despite considerable environmentalists concern expressed regarding negative impact upon vulnerable & endangered protected species of native bat colonies which roost in open abandoned mine shafts. Some shafts were fitted with bat friendly access grills, - but not all of them? The disturbance by initial dumping of Nancekuke demolition material followed by re excavation of said dump sites may have caused exposure/disturbance of hither too completely unknown/unrecognized indigenous or adapted native species. 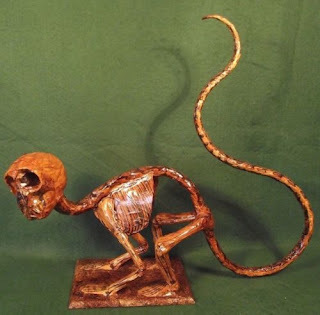 Or as is more broadly speculated, chemical/biological contamination may have contributed to a gross & rapid traumatic evolutionary mutation transition of an already existing species. - The Slithering. Alternatively a combination of both factors. An ever-expanding population growth of ‘Slithering’ is hypothesized & suspected. Although sighting encounters with humans are exceptionally rare, however since 2005 sightings & interactions have markedly increased. Sightings/chance encounters occurring primarily in Camborne/Redruth areas, but as far away as St. Day in Cornwall. All sightings are notably in former mining areas, spanning huge geographical areas of centuries of former underground workings. All these former working mines now abandoned, consisting of miles & miles of tunnels & passageways, many uncharted & not surveyed.